With the huge amount of cryptocurrency services and websites popping up lately it can be hard to discern the legitimate ones from the scammy ones. 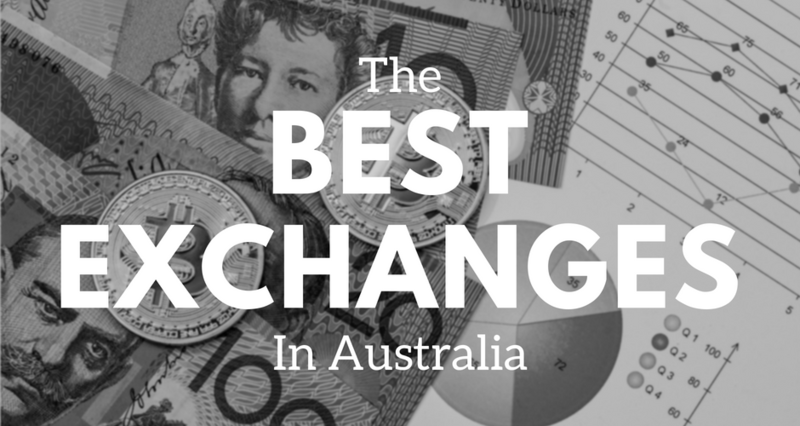 We’ve spent dozens of hours not only researching, but actually trading on a number of the most popular exchanges and compiled a list of the best exchanges to use in Australia. Before you sign up to any cryptocurrency exchange you first need to choose what type of exchange you wish to use. There are two main types of exchanges: those that allow you to purchase Bitcoin and crypto with fiat money (such as Australian Dollars), and those that only deal with cryptocurrencies. If it’s your first time buying cryptocurrencies, you will obviously need to use a fiat exchange to purchase Bitcoin. The first three exchanges that we have listed are all fiat exchanges and will allow you to purchase Bitcoin with AUD. Once you have purchased Bitcoin, you are then free to send it to any of the other exchanges on our list and buy and trade other cryptocurrencies as you wish. CoinSpot is far and away the top Bitcoin and cryptocurrency exchange that we recommend for Australians to use. This Australian crypto exchange has gone from strength to strength over the years, constantly adding new features that users request, lowering fees and just providing a hassle free trading experience. It is by far the easiest way to quickly get your hands on some Bitcoin or altcoins – you don’t need to buy Bitcoin and then send it to another exchange, you can do it all in one spot with AUD! Huge amount of cryptocurrencies available to purchase with Australian Dollars (AUD). At the time of writing, there’s over 100 and they add more every week. Instant deposits when using the POLi Pay service. Which means you can log in, deposit your cash and purchase your coins all in a matter of minutes. Our record is doing it in 90 seconds! They actually make changes according to what users suggest. For example, the exchange recently lowered their trading fees to be more in line with the industry standard. If your aim is to just purchase Bitcoin or other cryptocurrencies without all the bells and whistles, then CoinSpot is the exchange you’re after. Independent Reserve is another great Australian Bitcoin exchange that has been around since 2013 and are regularly referred to as one of the best in the industry. You can tell by the moment that you log on that the company takes pride in their appearance – they exude professionalism with their sleek looking charts and website design. Some of the lowest fees available. Depending on how much volume you trade, the trading fees can be as low as 0.1%! They also have free deposits, free AUD withdrawals and a tiny 0.0001 BTC withdrawal fee for Bitcoin withdrawals – which works out to be about $1 AUD at the time of writing. Very quick verification process. As with any fiat-entry exchange in Australia, you will have to go through a verification process. Independent Reserve had the quickest of all, we were verified in under an hour – which is very impressive. The exchange is extremely security conscious. They store a large majority of their Bitcoin and other digital assets in ‘Cold Storage’, this means that the coins are stored offline in encrypted hardware wallets. They then take the additional step of storing the hardware wallets in vaults at different locations. The company really seems to care about helping users to understand and trade Bitcoin. They have the most in-depth and helpful Help section we’ve ever seen, as well as an Education section which includes a free E-Book on understanding Bitcoin, written by one of Independent Reserve’s founders, the late Adam Tepper. Although Independent Reserve only has a few cryptos available for purchase (Bitcoin, Ethereum, Litecoin and Bitcoin Cash), these are the most popular coins and are more than enough to get your feet wet in the world of cryptocurrencies. BTC Markets is a Melbourne-based cryptocurrency trading platform that was founded in 2013. They currently offer 6 cryptocurrencies that you can purchase with AUD: Bitcoin, Ethereum, Litecoin, Ethereum Classic, Ripple and Bitcoin Cash. Great customer service. If you happen to run in to trouble or just need a question answered, you can message them directly on their Facebook page and they will usually respond within minutes. Their charts are implemented by TradingView. TradingView is tool that allows charts to be much more interactive – such as different views (candlestick or line), different timeframes, colours and indicators. This is an awesome feature if you’re a bit more experienced or into day-trading. They have 2 deposit methods; BPAY and a new service called Osko that is ran by BPAY, but is much quicker – the deposits with Osko usually clear within an hour. Overall, BTC Markets is a trustworthy and reliable crypto exchange that has been around for years. We have no problem recommending them as a great place to grab your BTC. Binance is a relatively new crypto exchange, they have only been around since July 2017 but have quickly become one of the biggest in the world. They are regularly the number one exchange for trading volume in the 24 hour period (sometimes exceeding over $4 Billion worth of trading volume in 24 hours). The company has several offices around the world and will be officially moving their headquarters to Malta sometime in 2018. Low fees – as low at 0.1% for trading, and if you hold Binance’s coin (BNB) on the exchange they will lower your fees even further to a tiny 0.005%! The company has a very public CEO (Changpeng Zhao), who regularly appears on TV and in magazines. This instills a lot of trust in the exchange, compared to other exchanges which aren’t so public with who runs them. You can tell that Binance really cares about their users. They hold regular competitions, giving away thousands of dollars worth of cryptocurrencies and have even given away several high-end cars. They have a huge amount of cryptocurrencies available to purchase and trade. At the time of writing, they have over 125! If you’re looking for an exchange that has very simple sign up, large amount of coins and tiny fees, Binance is what you’re looking for. HitBTC is a large crypto exchange that was founded in Hong Kong in 2013. They are regularly in the top 10 exchanges for volume processed in 24 hours and have exceeded $2,000,000,000 in volume for 24 hours at their peak. The company was created by high-level traders and financial professionals and boasts having the best technological products in the industry. To us, the exchange has the best trading interface out of all. In addition to the fantastic looking interface, they implement TradingView charts, which as mentioned earlier allows for a high level of interaction with the charts – such as the usage of indicators and tools. They have no limits on deposits or withdrawals across all of their coins. This is great if you wish to start trading with larger amounts of cryptocurrencies. HitBTC provides a thorough Help & Support section that includes everything you need to know about: account security, trading, deposits, withdrawals, coins & markets and their KYC process (Know Your Customer). This is extremely helpful with getting up to speed on the platform. HitBTC offers an outstanding trading experience from the moment you sign up (which takes only 2 minutes). They’re a great choice for purchasing and trading your altcoins. Cryptopia is a New Zealand based exchange that has seen a huge amount of growth over the past year. In December of 2016 they had around 30,000 users, by December 2017 that number had exploded to more than 1,000,000. Although, in terms of cryptocurrency exchanges, it’s still considered relatively small compared to exchanges like Binance. Cryptopia regularly add new coins that aren’t on other exchanges yet. This means that you can find some relatively unknown coins and pick them up for cheap before they’re marketed or added to larger exchanges (which usually causes a huge surge in price if they’re added to Binance for example). They have an online marketplace where you can actually spend your cryptocurrencies – without leaving Cryptopia. They also have a forum where you can interact with other users and discuss all things about cryptocurrency. Very easy to use and navigate. By just visiting the Exchange section, you can see a full list of their huge amount of coins, which allows you to simply click into that coin and start trading. Although Cryptopia might not have the huge volume that larger exchanges have, the amount of promising new coins that they add and ease of use more than make up for it. When we first started this website, we had one goal in mind: to help people get started with Bitcoin and other cryptocurrencies. This goal has not changed. We know that getting started with crypto can be a daunting process and many other guides out there on choosing the best exchanges were either outdated, or included exchanges that were no longer operating. We endeavour to keep this guide as up to date as possible to make thing as easy as possible for you and to stick to our core goal. The very first thing you should worry about with anything related to cryptocurrency is security. Before you give any exchange your details, it’s important that you run through a check list and see if they have these basic security measures in place: Do they offer 2 Factor Authentication (2FA)? 2FA is a system that ensures only the person who has your mobile phone is able to sign into your account. A time-sensitive code is sent to your mobile phone when you go to log in, you then enter this code before the time runs out and you can then access your account. This added layer of security is a huge help in preventing hacks. Is there website secure? Never sign up to an exchange that doesn’t have HTTPS (or a green lock) next to the URL. Has the exchange been hacked? It’s a good idea to search Google for the name of the exchange with the word “hack” next to it to see if there is any history of it being hacked. If it has, it’s important to read how the exchange handled the hack and if any users funds were stolen. Just because an exchange was hacked in the past, it doesn’t mean it is less secure now. In fact, if an exchange was hacked in the past it’s highly likely they’ve beefed up security since. In saying this, it’s extremely rare that you hear of an exchange being hacked. It’s only a very small percentage of exchanges that have ever actually been hack and users funds stolen. Do they have additional security measures in place? Ideally you want to use exchanges that use additional security measures such as storing their coins in cold storage and away from the exchange headquarters. However, not all exchanges are going to list every single one of their security measures on their website. If you’re new to cryptocurrencies, the last thing you want to do is accidentally make a mistake and send your Bitcoin to someone else’s wallet, never to see your Bitcoin again. You should look for an exchange that makes it easy to sign up, secure your account, deposit funds and purchase your coins. They should also have clear instructions on how to use their system. All of the exchanges that we have listed have great help & support sections to read, should you run into any issues. For the fiat exchanges, you want to have reliable payment methods to transfer your funds. The most common payment systems that the Australian Bitcoin exchanges use are: POLi Pay, BPAY, Electronic Funds Transfer (bank account to bank account transfer) and Osko. All of these payment methods have different processing times, ranging from instant for POLi Pay up until 1-2 business days for Electronic Funds Transfer and all have proven to be extremely reliable and are used by thousands of businesses across Australia. If you just want to get your hands on some Bitcoin or Ethereum, then this section shouldn’t worry you. But if you’re into trading altcoins, then it’s recommended that you stick to exchanges that have a large amount of coins and regularly add new coins. This shows that the exchange cares about what the users want to trade (by adding popular coins), and also shows that they’re moving with the times by adding new and exciting coins. It’s also great to be able to trade on just a couple of exchanges, rather than having coins across a heap. An exchange that has a large amount of coins ensures you’re able to do this. The great thing about so many different crypto exchanges popping up over the past few years is that they have become extremely competitive with each other. This is great for us users as it means lower fees! Ideally a good exchange will have free deposits for fiat and cryptocurrencies, minimal fees for cryptocurrencies (such as 0.0001 BTC for Bitcoin withdrawals) and absolutely no more than 1% fees for trading cryptocurrencies. If the exchange is charging anything more then the above fees, it would have to offer some great features to counteract the higher fees. This is how much fiat money you can deposit into the exchange in each 24 hour period. This is more likely imposed by the payment processor (e.g. BPAY) rather than the exchange. Cryptocurrency deposits generally have no limits. Some exchanges will impose a withdrawal limit – either by 24 hour period, or by transaction. This can be quite costly if you wish to withdraw large amounts, as you will need to withdraw your coins in seperate chunks, and as mentioned in the Fees section, there is generally a fee for withdrawals. To counteract this, most exchanges will increase your withdrawal limit if you email them to ask, or if you go through their verification process. Although not very common, some exchanges will have a limit on how much coin you can purchase for each individual transaction. It is generally quite a substantial amount (e.g. $20,000). Where do I store my cryptocurrencies after purchasing them? This is a matter of personal preference and how security conscious you are. Some people simply choose to store their coins on the exchange after purchasing them and have never had any issues. The safest way to store your coins is in a hardware wallet such as a Nano Ledger or Trezor – although these hardware wallets do not support every single coin. The next recommended way to store your coins would be on a desktop wallet that is downloaded from the coins’ official website – always ensure that it is the official website and not an imposter. Do all exchanges have the same coins at the same price? No. Prices are always different on different exchanges, although they are generally very similar and if a coin rises or falls on one exchange, the others will generally follow. There’s a huge difference in price between exchanges, can I buy it on the cheaper one and sell it on the more expensive one? This is called arbitrage and is a known method of making money, but it’s not really recommend to do if you are new. For one, there are computer programs (bots) that constantly scan prices of coins on exchanges and execute these trades automatically – much faster than a human can do it! And two, coin transaction times can take an unknown amount of time so the price will likely have changed by the time your coins have arrived at the exchange to sell. Do I have to show the exchange any type of identification? For fiat exchanges, you will have to go through a verification process that includes showing the exchange some identification. This is a requirement of the Australian Government and their Anti-Money Laundering laws. For purely crypto exchanges, you won’t have to go through any type of verification – unless you wish you increase your limits to substantial amounts. How do I buy Bitcoins in Australia? If you’re still unsure to how to actually get your hands on some Bitcoin, then we recommend you start out by reading our guide on how to buy them, which you can find here. As you can see, there’s quite a lot to take into account when choosing the best exchange. Ultimately, a lot of exchanges will have very similar features and it will all come down to personal preference of what you enjoy using the most. We recommend signing up to each exchange on the list, having a look around and seeing which one you like best. We will be sure to keep this list up to date as new exchanges are developed.